Grew Up… in the totally awesome town of San Dimas, Calif. Bill lives with his father and his young stepmother, Missy. Visiting… the past. Bill and Ted met the mysterious Rufus, who gave them access to a time machine from the future, in the parking lot of their local Circle-K convenience store. 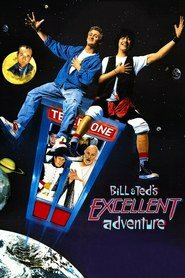 Now, Bill and Ted find themselves traversing the centuries and encountering the great figures of history in the flesh. Profession… high school student. Bill, not known for his studiousness, is having a bit of trouble with his schoolwork, especially his mightily difficult history class. Interests... performing with his band, the Wyld Stallyns. They're going to make it big some day. All he needs to do is to convince Eddie Van Halen to join the band. Relationship Status... single. But Bill and Ted have hit it off with some princesses in 15th Century England, and with a time machine, it seems that anything might be possible. Challenge… passing his history class. If Bill and Ted don’t come up with a passing grade on their next history assignment, they will fail the entire class. If that happens, Ted’s strict father will send him away to a military academy in Alaska. Bill has to help Ted travel through time and recruit “personages of historical significance” to participate in their history presentation. Personality… sweet and simple. Bill’s lack of social graces is often charming, especially when he tries to converse with the great philosophers from history. He likes to quote his favorite thinker, “So-cratez” (i.e. Socrates):“The only true wisdom consists in knowing that you know nothing.” In that case, Bill S. Preston, Esq., is practically a genius. Bill S. Preston's popularity ranking on CharacTour is #2194 out of 5,000+ characters. See our top-ranked characters and read their profiles.